Sarsour has no shame and she definitely not representing the USA. Today she proves that once again! 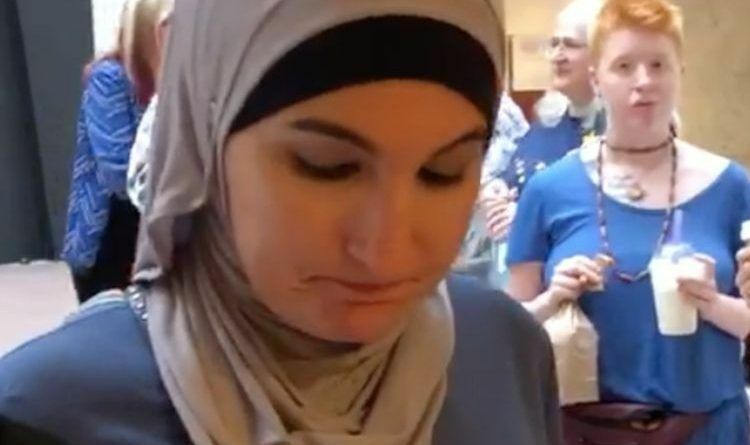 Among the crazies who disrupted the confirmation hearing for Brett Kavanaugh was far left radical Women’s March leader Linda Sarsour who was one of the first to start screaming from the audience during the hearing. The video below shows Sarsour standing up and shouting, “This is a mockery and a travesty of justice!” before being hauled away by security. Sarsour entered the hearing room in the Hart Senate Office Building just before 9:30 a.m. EDT. She sat quietly with other anti-Kavanaugh activists until the hearing opened, at which point she loudly rebuked Republican lawmakers and urged them to adjourn. She continued to shout at senators as she was dragged from the room by multiple police officers. Several other activists brandishing signs immediately followed suit and were removed. Sarsour was back in the Senate building where she was arrested just hours later. Ironic that if she pulled a stunt like this in her home country, they would have stoned her to death. I think only invited guests should be allowed in the hearings. Then you can control the environment better. And you will know who invited the protesters! She needs to be banned from events in the U.S. Capitol for a lifetime she shouldn’t be able to return just hours later!